The belief that the willow tree (Salix alba) has mystical and magical powers is centuries old. So is its spiritual alignment to the moon and to water. This majestic tree grows in Europe, Asia and North America, reaching lofty heights of between 50 and 70 feet. Its imposing appearance is part of its mystique, So is the wide array of meanings the willow tree has come to signify. Celtic beliefs equated the willow tree to a conduit for powerful psychic forces and visions. The Celts also believed that the first human beings were descendants of trees. Ancient healers first discovered the medicinal properties contained in the leaves and bark of the willow tree, They applied these preparations as remedies for aches, fever and rheumatism among other maladies. Salix alba produces salicylic acid, an ingredient in aspirin. The willow tree is featured in many works of literature. In 1853, Hans Christian Andersen wrote “Under the Willow Tree” in which a learned elder willow answers children’s questions. In Kenneth Grahame’s classic 1908 children’s novel “The Wind In The Willows,” the tree plays a supporting role to a cast of animal characters led by Mr. Toad of Toad Hall, Mr. Badger, Mole and Ratty. “Green Willow” is the name of a Japanese ghost story about a young woman with whom a samurai falls in love. “The Wisdom of The Willow Tree” was a Native American tale. Perhaps the most famous willow tree in recent literature is the “Whomping Willow” at Hogwarts, the school of magic for wizards attended by Harry Potter and his friends, Hermione and Ron. The tree is key to the story in the series of Harry Potter books written by J.K. Rowling. According to a birthday tree chart posted at Wowzone.com, everyone’s birthday corresponds with a particular tree. Those whose birthdays fall between March 1 and 10 and September 3 and12 have the weeping willow as their corresponding tree. On the negative side, this is associated with melancholy. However, there are lots of positive features, not the least of which are attractiveness, tastefulness and honesty. Willow tree people are also said to be dreamers and to enjoy travel. 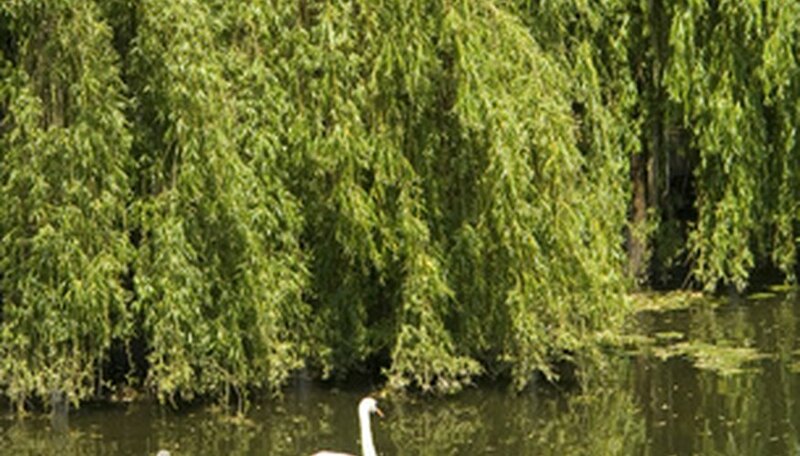 According to the Celtic Tree Astrology chart at Whats-Your-Sign.com, those born between April 15 and May 12 are linked to the willow tree. They are said to have psychic powers and to be intelligent and perceptive. They are compatible with people born under the signs of the birch and ivy trees. During the 18th and 19th centuries, it was the practice to embroider mourning cloths to commemorate the passing of a loved one. The embroidery traditionally pictured a weeping willow tree together with other symbols of a passing, such as a mourner and a tombstone or urn. .
Andersen.sdu.dk: "Under The Willow Tree"
Firstpeople.us: "The Wisdom Of The Willow Tree"